Forget international climate talks – women around the world are already taking the clean energy transition into their own hands in ways only women can. Yesterday was the third ever ‘gender day’ at the UN climate talks in Paris, a day of gender-focused sessions that provides a platform for the often overlooked but massively important issue of how gender inequality is linked to climate change. But whilst gender has certainly moved up the COP agenda in recent years, it remains a marginal issue. In more than two decades of negotiations, the UNFCCC has adopted just three decisions explicitly focused on gender-related issues – two of which were in the last three years. Last year at COP20 in Lima, just 36% of delegates were women, and this year former UN human rights chief Mary Robinson has said that COP is still too male-dominated. Their exclusion from conventional positions of power and decision-making is perhaps why women are so prevalent in grassroots movements and ground-level solutions to climate change – particularly in the global south. Here are three current energy projects that are led by or focused on women, that illustrate the social, political and economic benefits of decentralised clean energy generation for the world’s most vulnerable people – and for the climate. These examples are all about solar power, but there are literally countless other ways that women are proving instrumental in both adapting to and mitigating climate change all over the world. Gender inequality (and women’s greater vulnerability to the effects of climate change) is often directly linked to poverty, but studies show that the greater the proportion of a country’s population that has access to electricity, the greater its gender equality, regardless of the amount living below the poverty line ($1.25 a day). Fossil fuel companies will use this kind of information to insist that cheap coal is vital to the development of countries in the global south, but women-led social enterprise Solar Sister has an alternative plan – one that economically empowers women and doesn’t involve burning the most polluting fossil fuel around. Solar Sister aims to eradicate energy poverty by creating a deliberately woman-centered direct sales network that brings clean energy tech to some of the poorest and most remote communities in rural Africa. Women buy solar lamps and clean cookstoves from other women to use and sell in their own communities, supplementing their income whilst giving them light to read and work by that doesn’t involve inhaling toxic fumes. This project is similar to Solar Sister, but it goes one step further along the intersectional scale, focusing on perhaps the most vulnerable type of woman – an old one. In societies across the world, from remote rural villages in India to developed countries in the global north, women lose their social value as they age – no longer (conventionally) attractive or reproductive, they outgrow their use and are accordingly gradually sidelined. 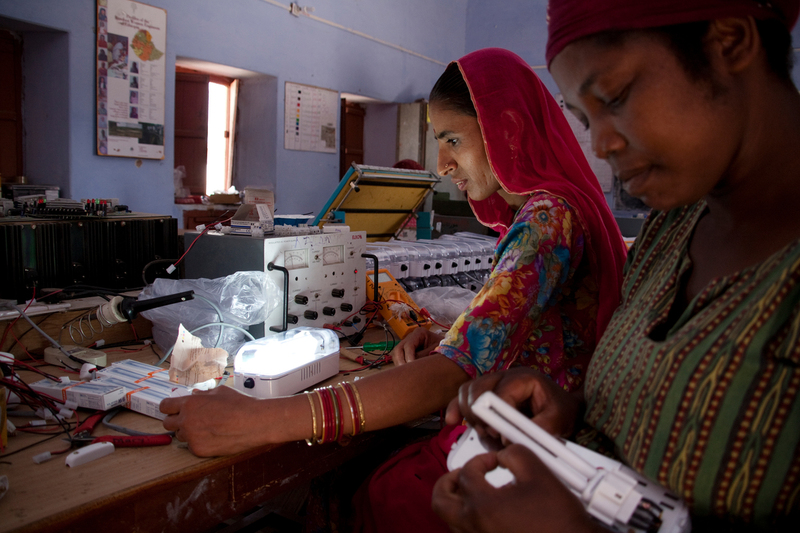 The Barefoot College in Rajasthan trains older Indian women to become solar engineers, allowing them to challenge perceptions of their obsolescence, raising their social standing and influence in their communities. Solar grannies, as they are known, demand respect for their specialist knowledge, and for bringing transformative access to light to their villages. Training older women is also a strategic choice. Young men invariably leave their villages for work, and would take their knowledge with them, leaving the community without someone to maintain solar panels and lamps, and without someone to pass on their expertise to the next generation. Old women are embedded in their communities, taking care of children and playing a key role in all domestic operations, including energy use. The solar grannies, most of whom are illiterate, complete a six-month training course at the Barefoot College before returning to their homes armed with screwdrivers, batteries, circuit boards, lightbulbs and a new sense of (well-deserved) self-respect. This one is just a brilliantly simple bit of solar tech that’s in use in sixteen countries on five continents, invented by Eden Full Goh, a young American woman who didn’t feel comfortable being funnelled into the oil and gas sector as most of her fellow engineering students are expected to do – which makes sense, as polls show that women tend to care more about climate change than men do. Instead she chose to build on an idea she had in high school – how to make solar panels track the sun efficiently. The product she ended up with uses bottles of water and gravity to slowly tilt the solar panel over the course of the day, which increases output by 30% without using any extra power. It also provides 4 litres of clean drinking water in the process, filtering the water out of the weights and into a receptacle ready for drinking. Increased output means less solar panels, which saves people money and saves the energy it takes to make solar panels. People in impoverished off-grid areas often have to choose between spending their little income on energy or clean water – this way, they get both for less. The gender imbalance in the energy industry is a big problem. In the UK, more than two-thirds of the 100 biggest energy companies fail to count a single woman on their boards, and fossil fuels are the worst culprits: while women occupy 17% of board seats for power and renewables firms, the oil and gas sector manages a pathetic 7%. Is that because fewer women are interested in careers with businesses that directly contribute to planetary meltdown, or because the kind of people who run fossil fuel companies are also the kind of people who would only hire women as secretaries? Who knows.